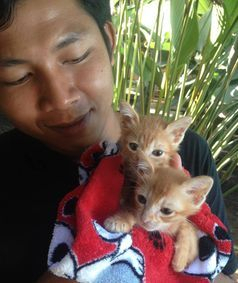 Villa Kitty is a kitten & cat rescue and rehoming Clinic in Bali. This clinic provides crisis care, long term care, medical care for the cats of Bali and endeavours to find homes for all cats once healed and ready to be rehomed. We have supported Villa Kitty since it's inception and believe it is the best & cleanest cat shelter we have visited ever, we hope you will want to support Villa Kitty too. Villa Kitty receives no government funding and relies on donations from kind people. All cats are sterilised and vaccinated before rehomed. Any Australian who has holidayed in Bali knows about its famous street dogs. Organisations such as the Bali Animal Welfare Association (BAWA) and the Bali Dog Adoption Rehabilitation Centre (BARC) have been established to improve the welfare of these animals and adopt them to loving homes. Until 2011 there was no dedicated facility for Bali’s stray feline population. Yet the island’s cat population has to contend with significant challenges: motorcycles and cars in narrow streets, street dogs who see them as a meal ticket, pythons (also known for targeting well cared for domestic pets), and human neglect. Vaccination is uncommon, and canine parvovirus is rife, creating the perfect window for infectious diseases such as feline panleucopaenia virus to emerge as a significant threat. Kittens are often orphaned at a young age, leaving them extremely vulnerable to the ravages of intestinal parasites and severe respiratory disease. 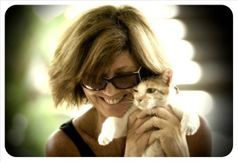 Villa Kitty, established in March 2011 by Australian expatriate Elizabeth Henzell, is a dedicated sanctuary for Bali’s vulnerable feline population. There is a veterinary clinic attached to the shelter. Despite housing over 120 cats and kittens, the facilities are cool, clean and far removed from the chaos of the busy streets just metres away. They have the capacity for 50 healthy cats and kittens in their original building which has the Rainbow room for the fully vaccinated and sterilised cats, the three small West Wing rooms for vaccinated kittens that are still too young to be sterilised and the Maderson Wing maternity runs for the mother cats and their kittens. The Molly Parr Wing is the quarantine building which is made up of 3 rooms divided into two runs each and one large room for the tiny kittens that need to be held in cages until they are in a better state to put them in the runs. One of the biggest challenges in running the shelter is the low rate of vaccination in the community, coupled with the high population turnover, sometimes in a period of less than a month the shelter can admit 40 or so new cats or kittens which stretches the shelter to it's limits. The hospital is divided into wings for cats suffering from gastrointestinal disease, and another for cats with respiratory symptoms. 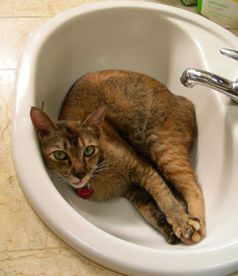 The most common problems seen are the typical scourges of cat shelters worldwide: flu, diarrhoea and ringworm. Trauma is extremely common, with fractured spines and eye injuries necessitating enucleation particularly frequent. They would love to set up a sponsored program to provide sterilisation for cats and kittens of families who cannot otherwise afford this procedure. They would also love to set up a sponsored program weher the shelter can provide ongoing food for a rehome cat to a local person. 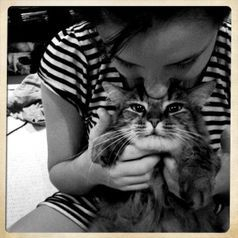 If Villa Kitty could cover the costs of vaccinations and annual food for families who would love to have a cat in their home ,they would be able to rehome many more cats to local families. 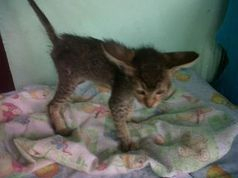 Overseas visitors spending any length of time in Bali can assist by fostering kittens or volunteering as kitty cuddlers. Donations of food and bedding are always welcome. The Indonesian Government imposes strict regulations which limit international veterinarians from volunteering their veterinary skills. However, while Australian veterinarians cannot perform surgery or provide hands-on treatment to animals, provision of services in a consultancy capacity is still very helpful. "From our first days of just three caretakers, our two vet assistants, Kadek and Jopi, and myself, we have grown to twenty three staff! The Villa Kitty veterinarian team is led by one of Bali’s most respected vet surgeons, Drh Karnata, with Drh Isa and Drh Sinta caring for all our sheltered cats and kittens. Our seven vet assistants who cover 24 hour shifts are Kadek, Jopi, Ketut, Liong, Komang, Nyoman, Gede Artha who doubles as our part time admin assistant. He is a very diligent young man who works hard to ensure all our records are up to date and the staff get paid on time. Our famous chef, Mbak Eka, not only manages our kitchen and prepares the meals for our cats, kittens and dogs, but she is also the talent behind the wonderful Villa Kitty lunches held in our beautiful gardens every Sunday. Mbak Eka is ably assisted by Ibu Made who are also part of our five staff cleaning team, along with Bu Tutsih, Ibu Ketut, and Ibu Ketut Pindang (Little Fish), Ketut Putri, Kadek Sri dan Ibu Komang. Possibly the toughest job is done by one of the sweetest people you would ever hope to meet. Iluh arrives every morning around 7 o’clock and cleans all the kitty trays. A recent call out for gloves showed us that there are many people who care about our staff who care about the cats and kittens here at Villa Kitty. It wouldn’t work without them. The Villa Kitty dogs are walked, groomed and trained by Komang. Yes, we have seven rescued Bali street dogs who gallantly watch over the property and the kitties! Komang is our ‘roustabout’ and ensures we don’t run out of anything. Pak Gading and Pak Alus maintain our beautiful gardens and secure Villa Kitty each night. Pak Mangku sees to all our spiritual offerings every morning. And finally a man that I call my family. Nyoman Suaspa, is part of the family who own the land that Villa Kitty leases. Nyoman has been a huge support since the first day I met him and in on our board and is an adviser to Villa Kitty. This is a team of people I am very fond of who take pride in the work we are doing at Villa KItty."